It's no big secret that Toybiz has a hard-on for certain Marvel characters. Spider-Man, Wolverine and, to a lesser extent, Iron Man... and yet with all that attention, this is the first time Spider-Man has appeared as a single-carded figure in the Marvel Legends line (for those keeping track, he's actually been in a few box sets, like the Urban Legends, Sinister Six and recently released Fearsome Foes). Spidey is also responsible for kick-starting Marvel Legends; the clamshell-packaged "Spider-Man Classics" series was ML's precursor. Since then, with the exception of his box set cameos, Spidey's been relegated to his own eponymous blister-packed line, the progeny of the aforementioned SMC... until now. 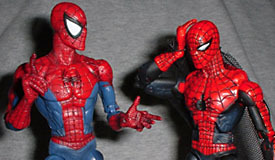 Spidey's ML figure differs from all the other Spider-Men out there in that it's based on his first appearance in Amazing Fantasy #15. It could be argued that this is actually the second 1st Appearance Spider-Man figure, since there was a "Classic Spider-Man" released in the SMC line. While it did come with a reprint of Spidey's 1st appearance, it wasn't nearly as specific to his first appearnace as this new fig is. Though inside the actual issue Spidey isn't really drawn with any sort of consistency, the figure is a great representation of the iconic cover image of Spidey swinging through the city with a hapless passenger in tow (hapless passenger not included). To accomplish this look, the figure's trademark "eyes" are small and more slitted than usual, and the areas of his costume that are normally light blue are now so dark that they're nearly black. The spider logo on his chest is much more simplistic than it is these days, and his webs are thankfully sculpted, and not simply painted. The etched web lines are then filled with paint, and Toybiz has done an impressive job of getting the web paint to match up with the sculpted lines. This figure continues the trend of Spidey figures that feature the costume's underarm webbing... or, at least, a feeble attempt to simulate Spidey's underarm webbing. Like the Sinister Six and Fearsome Foes Spider-Man figures, this guy features a sloppy mesh netting that connects to Spidey's neck and wrists. It looks okay from the front, but from the back it looks like he's wearing some sort of halfassed cape. 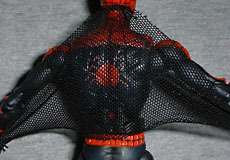 Instead of connecting somewhere on Spidey's torso like it does on the costume we see in comics, this netting covers the entire upper back of the figure, obscuring all the sculpted details. It could be removable, but it's jammed so far up into the neck articulation (and actually, looped around the neck peg) that I'm afraid to touch it. Some have taken to cutting the netting off completely, but that's an extreme step I'm not willing to take. All in all, it's only a mild annoyance. The figure moves at all the requisite Spidey movement points: balljointed neck, hinged laterals, balljointed shoulders, peg biceps, double-hinged elbows, peg forearms, hinged wrists, hinged knuckles (4 on each hand), hinged torso, peg waist, balljointed hips, peg thighs, double-hinged knees, peg shins, hinged ankles, and hinged midfoot. 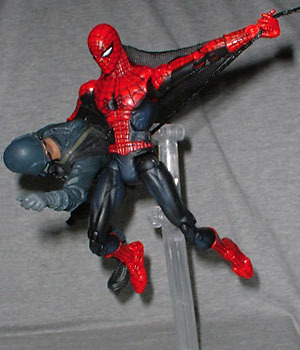 Spidey has always been a flexible guy, and ToyBiz has always used him as a flagship to show off all the crazy articulation they can fit into figures. This figure doesn't break any new ground, but he's got it where it counts. His joints are tighter than usual, which is a good thing, but his knees have that kind of bow-legged look that other Spideys have been known for. 1st Appearance Spider-Man comes with the same clear Doop-stand that comes with every figure in the 10th series of Marvel Legends. Spidey jumps around a lot, so the stand is a pretty useful accessory, unlike the ones that come with, say, Omega Red and Mr. Sinister. He also comes with a comicbook, which features two different Spidey stories. The first story is appropriately a reprint of his first appearance in Amazing Fantasy #15, but instead of the other tales that originally appeared in that issue (which incidentally involved mummies and Martians), we get a second Spider-Man story that deals with him facing off against the Fantastic Four. The webhead comes off as a pretty big jerk in both tales, but the Fantastic Four story is absolutely hilarious. It involves Spidey trying to steal the Human Torch's girlfriend, creating a giant bat out of webs, and falling in love with the Invisible Girl, among other things. It also has some pretty priceless dialogue. Spider-Man's final accessory is the coolest part of the mutant-hunting Sentinel robot. Peter Parker comes packaged with the head, chest, and shoulders of the machine. Even if you don't collect all of the robot's parts, this part is great as a stand-alone "defeated Sentinel" base upon which to pose all your triumphant mutants. The piece is painted mostly in metallic gold, purple and blue, with beady green eyes and an orange yellow chest... glowy... light thing. 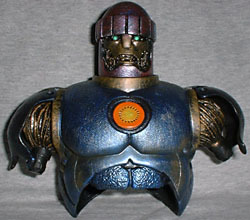 It features a limited balljoint in the neck and balljointed shoulders. Toybiz had to know that the only way fans were going to buy yet another version of Spider-Man was to get the most important part of one of the X-Men's greatest foes. Luckily, it's a pretty decent version of the ol' webslinger. Do you like getting Spidey as a Marvel Legend, or were you under the impression that he had his own toyline? Tell us on our message board, the Loafing Lounge.